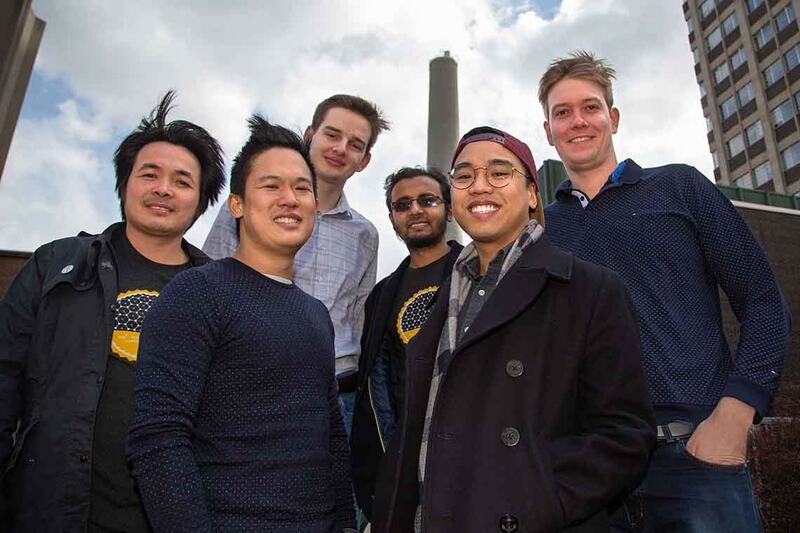 A team led by the University of Toronto's Faculty of Applied Science & Engineering that is working to capture greenhouse gas and recycle it into useful chemicals has advanced to the finals of the international NRG COSIA Carbon XPRIZE. The competition presents this challenge: capture carbon emissions from power plants and efficiently convert them into valuable chemical products. Finalists were revealed at Bloomberg New Energy Finance’s Future of Energy Summit in New York City. CERT, a team of two dozen multidisciplinary researchers working with Professors Ted Sargent and David Sinton, is one of just five teams around the world to make it into the third and final round in the natural gas plant stream. Thirty-eight teams from five countries, and from both industry and academia, entered the competition, with 27 qualifying for Round 2. The field is now down to five, with an additional five finalist teams working to capture and convert emissions from coal-fired power plants. Currently, power generation produces more than 32 gigatonnes of climate-warming carbon dioxide (CO2) annually – that’s 32,000,000,000 tonnes. Renewable forms of energy, such as solar and wind, hold promise to help reduce that number, and have decreased in price and increased in capacity in recent years. By 2022, global renewable electricity generation is expected to grow by another one-third to over 8,000 terrawatts per hour. CERT capitalizes on this trend by using green energy to capture and convert CO2 to useful chemical compounds. To achieve this rapid scale-up, CERT overcame significant materials and engineering challenges in just one year: They advanced their technology from a catalyst the size of a fingernail in a beaker to a continuous flow system the size of a small car. A team of XPRIZE judges visited Toronto in December to evaluate CERT’s capabilities and potential for Round 3. CERT spent three days with the XPRIZE team at the XEROX Research Centre of Canada in Mississauga, where the judges evaluated their technology and data. They conducted their Round 2 research with $833,333 through a TargetGHG Stream 3 grant, supported by Ontario’s $74 million Green Investment Fund, and administered by Ontario Centres of Excellence (OCE). The work was also conducted in partnership with Quebec-based company CO2 Solutions Inc., which provided the team with carbon capture technology. "Team CERT's XPRIZE demonstration is a major advance in scaling up electrocatalytic CO2 utilization technologies, an important step in translating science from the bench scale to practical implementation.” said Thomas F. Jaramillo, associate professor in Stanford University’s department of chemical engineering. Jaramillo is also the director of the SUNCAT Center for Interface Science and Catalysis, a Stanford-SLAC partnership.